“So we beat on, boats against the current, borne back ceaselessly into the past” Fitzgerald writes of Gatsby, the ultimate line ends the book. At times like this (excruciating exposition withheld for brevity’s sake) I want to belly up to the bar, forget my obligations, and let oblivion bring me back to finals week in college with a little Allman Brothers playing in the background. But, let’s face it–that “workout” is not good for training, and if you have ever met an Ironman-In-Training, you know we are like Catholics the next day after a binge-we feel a tremendous amount of guilt and repent in a self-loathing manner. Pain will not surmount memory, and thus combined, creates a bigger cycle of guilt to overcome. But I need a drink. Beer won’t cut it. Deep wines to relieve the stress will be too heavy. 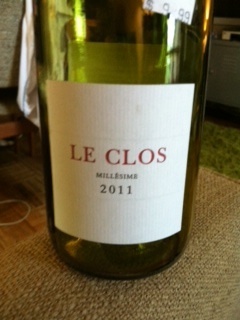 So I turned to a good friend, a French wine, Les Clos, 2011. The Wine: This red, Languedoc wine drinks easy like Sunday morning (if you went to bed by 8 pm). A blend of Merlot, Cabernet Sauvignon, Carignan, and Grenache mixes up the fruit-forward flavors and light secondary notes nicely–offering a nose and palette of youthful red and black berries and spice (white pepper and vanilla oak). The alcohol-at 13%-is balanced with light tannins. The body is light, the finish is light-to medium, and the guilt is low on the self-flagellation pole. It’s like Weight Watchers in a bottle! Where: I purchased this (*again) at Cleveland Park Liquor & Fine Wines shop for $9.99 (the price is another guilt-reducing benefit). I am also slightly amused (and contented) that The Diner in Adams Morgan DC (one of my favorite go-to food joints) serves Le Clos. This wine will drink well this summer on hot days and well on into the fall. I would have this on hand as a go-to, a stand-by, and wouldn’t hesitate to take this to a casual dinner at a friend’s house. Can drink, be merry, and still make the workout on this wine.